The Spanish Imperial Eagle, also known as Iberian Imperial Eagle or Adalbert's Eagle, (Aquila adalberti) is closely related to the Eastern Imperial Eagle (Aquila heliaca). 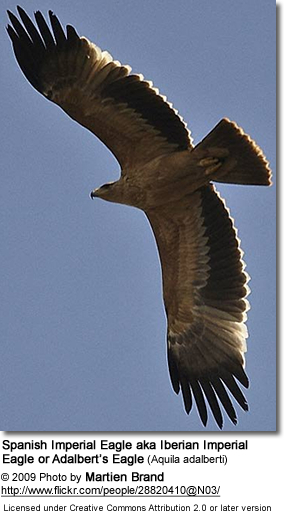 Formerly (Sangster et al., 2002), the Spanish Imperial Eagle was considered to be a subspecies of the Eastern Imperial Eagle, but is now widely recognised as a separate species due to differences in morphology (Cramp and Simmons, 1980), ecology (Meyburg, 1994), and molecular characteristics (Seibold et al., 1996; Padilla et al., 1999). The binomial commemorates Adalbert of Prussia. It occurs only in central and south-west Spain, Portugal and possibly northern Morocco. In 2006 there were around 220 pairs reported in Spain and 2 in Portugal, and though numbers are showing signs of recovery, it is still an endangered species. A small population is preserved in Doñana National Park, Spain (descendants from only seven pairs in 1970: Schuhmacher, 1973) but its stronghold is the dehesa woodlands of central and south-west Spain. The species is classified as Vulnerable. Threats include loss of habitat, human encroachment, collisions with pylons, and illegal poisoning. There has also been a decline in the Spanish rabbit population, as a result of myxomatosis and other viral illnesses. The current population is estimated at less than 500. In February 2009 one male of the extremely rare Portugal population was shot. 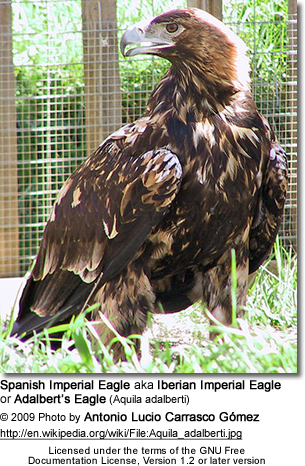 The Spanish Imperial Eagle is smaller, 2.5–3.5 kg (5.5–7.7 lbs) and 75–84 cm (30–33 in) in length, and darker than its eastern cousin, and is a resident species (A. heliaca migrates to the southeast during winter). It feeds mainly on rabbits, but can prey on many other animals, such as partridges, rodents, hares, pigeons, crows, ducks and even dogs.